When great companies' share prices plunge for all the wrong reasons, it's high time to hit the "buy" button. 2018 has been a rocky year for investors in the stock market. The S&P 500 benchmark battled through Chinese–American trade tensions and unpredictable economic trends to reach 10% higher in September, then lost it all on gloomy earnings reports in October. Big drops can be terrifying, but there's also a real upside to plunging stock prices. The old investing ideal of buying low and selling high works so much better when you can buy stocks at a discount. So when we asked a few contributors to the Motley Fool to share their best investing ideas for this moment in time, they were quick to come back with some fantastic businesses in Wall Street's bargain bin. Read on to see why this is a great time to buy Google parent Alphabet (NASDAQ:GOOG) (NASDAQ:GOOGL), discount-store operator Ollie's Bargain Outlet Holdings (NASDAQ:OLLI), online retailer Amazon.com (NASDAQ:AMZN), credit ratings specialist Moody's (NYSE:MCO), and merchant services expert Square (NYSE:SQ). Steve Symington (Alphabet): Shares of Alphabet have fallen 5% on the heels of its quarterly report a week ago, but don't take that to mean the parent company of Google showed any meaningful weakness in its results. For perspective, Alphabet's quarterly revenue soared more than 20% year over year to $33.7 billion, translating to net income of nearly $9.2 billion. The former, however, fell slightly short of Wall Street's prediction for sales closer to a flat $34 billion. Never mind the fact that Alphabet management doesn't provide specific quarterly guidance or that -- as CFO Ruth Porat insisted -- their underlying business "continues to have strong momentum globally, led by mobile search and [Alphabet's] many products that help billions of people every day." More specifically, Google now has eight products that each boast at least one billion monthly active users, including Drive, Search, Gmail, Maps, YouTube, Chrome, Android, and Google Play. Most of those products support Alphabet's thriving advertising business, where sales increased 20.3% last quarter to just under $29 billion. But its non-ad businesses -- think Google Play, Cloud, and its hardware products like Google Home, Nest, and the Pixel smartphone -- are enjoying even greater momentum, with Q3 revenue climbing 29.2% to more than $4.6 billion, helping the company to further diversify its operations. On top of that, Alphabet offers the promise of its "Other Bets" segment. These early-stage subsidiaries aren't profitable yet, but they offer enormous long-term potential and include the likes of Fiber high-speed internet, Verily life sciences products, Alphabet's investment and venture capital funding groups, and various other moonshot initiatives like Waymo self-driving vehicles and Calico human longevity solutions. Given Alphabet's unrivaled industry leadership and stellar growth from its established operations, its solid financial position (cash and marketable securities stood at almost $102 billion at the end of last quarter), and multiple longer-term irons in the fire, I think the recent pullback offers a perfect chance for patient investors to step in. Todd Campbell (Ollie's Bargain Outlet): The fast-approaching holiday shopping season makes it the perfect time to buy Ollie's Bargain Outlet. A 22-state retailer, Ollie's Bargain Outlet acquires close-out and brand-name products at deep discounts it can sell "at prices up to 70% below department stores and fancy stores and up to 20–50% below mass-market retailers." It operates 282 self-described "semi-lovely," no-frills locations, and it drives foot traffic to them with a lighthearted, self-deprecating sense of humor that promotes a "when it's gone, it's gone" treasure-hunt mentality. It also boosts visits through its popular Ollie's Army rewards program, which gives members perks, including a 10% discount on their next visit when they spend $250. In 2017, Ollie's Bargain Outlet's sales were $1.08 billion, up from $541 million in 2013, and in Q2 2018, sales totaled $288 million, up 13% year over year. Its profit is growing even faster, though, because its size is allowing it to cut even better deals with suppliers. Last year, its net income was $128 million, up from $19.5 million in 2013, and in Q2 2018, it was $26.1 million, up 46.2% year over year. We're approaching Ollie's Bargain Outlet's busiest time of year, but it could pay off to own this stock long term. The company is less than a third of the way toward the 950 locations it thinks the U.S. market can support, so there should be plenty of profit-friendly growth in the years to come. Is it Prime Day again? Amazon is on sale! Anders Bylund (Amazon): If you always wanted to start a position in this disruptive e-tailer and cloud-computing veteran but never could stomach the constantly rising stock price, this is your chance to make a move. After setting fresh all-time highs in early September, briefly boasting a trillion-dollar market cap, Amazon's chart turned downward again. The stock traded largely sideways in September, starting when Amazon announced a $15 hourly minimum wage for all of its workers in the U.K. and the U.S. The third-quarter earnings report followed, showing 11-fold earnings growth and 30% higher sales compared to the year-ago period. That report did not trigger a positive turn in Amazon's wilting stock chart, though. Instead, share prices fell as much as 10% the next day. You see, management set up modest sales growth expectations for the upcoming and oh-so-important holiday quarter. Delivering roughly 15% year-over-year sales growth would hit the midpoint of the guidance range, and it would also be a low-water mark for Amazon's rambunctious revenue growth. So the stock is trading 25% below September's all-time highs now. This plunge has its reasons, but they are of the knee-jerk variety and likely to be short lived. Yes, Amazon's top-line growth is taking a breather. Fellow Fool Jeremy Bowman argues that the slowdown might be permanent, too. On the other hand, earnings and cash flows are skyrocketing as the company turns its sights away from maximizing sales growth. The long-term goal these days is to "optimize free cash flows," which means widening margins and generally investing in profitable business ventures. The empty calories of red-line growth at slim profit margins are going away. Over the next few years, we should see Amazon's bottom line exploding even though its revenues might start hanging around in the more modest 15% to 20% range. I think that's an attractive strategy shift that will create plenty of value for Amazon shareholders in the long run. So why not get started now, with a quick 25% discount on Amazon shares? Brian Feroldi (Moody's): The recent rise in interest rates is causing debt issuers of all types to think twice before they float a bond or two. That backdrop is making it hard for bond-rating agencies like Moody's to post strong growth. In the most recent quarter, Moody's revenue only grew by 2%, which was a bit shy of the growth rate that market watchers were expecting. When combined with the recent marketwide sell-off, Moody's shares have fallen by more than 20% from their recent high. I think that's providing investors with a great chance to get in. Bond-rating agencies play a pivotal role in the world of finance. Most investors won't lend a company or government money until one of the big three credit rating agencies -- which are Moody's, S&P, and Fitch -- assigns them a grade that reflects how credit-worthy the issuer is. In exchange, these agencies get to charge hefty fees since they know how much their stamp of approval is worth. Rating bonds tends to be a highly lucrative business, since it doesn't require a lot of capital investment. 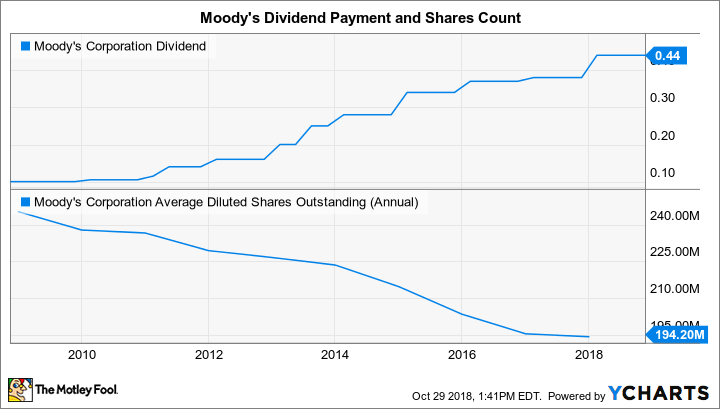 That fact has allowed Moody's to crank out consistent profits that are used to make acquisitions, pay a growing dividend, and knock down its share count. MCO Dividend data by YCharts. While the volume of bonds that need to be rated will wax and wane with interest rates, I have high confidence that Moody's will consistently be able to take its fair share of the pie for the foreseeable future and, in the process, to benefit investors. With shares currently trading in bargain territory -- the stock is trading for less than 17 times next year's earnings estimates and offers a dividend yield of 1.2% -- I think right now is a great time for investors to buy a great business at a discounted price. Matt Frankel, CFP (Square): If you had been considering adding shares of fast-growing fintech company Square to your portfolio but were scared away by the stock's rapid ascent, now could be your second chance. Since reaching $100 about a month ago, Square has dropped by more than 30%. There are a few reasons for this in addition to the overall market weakness. First, Square announced that it's planning to enter the consumer credit space through its Square Installments platform. This move is perceived as an additional risk by many experts and caused a small drop in the stock price. Second, it was revealed that CEO Jack Dorsey sold more than 100,000 shares, but it's important to mention that this was a planned sale and doesn't indicate Dorsey's feelings about the stock's value as an investment. Finally and most significantly, CFO Sarah Friar announced her pending departure. This is certainly a negative news item -- after all, Friar has done a fantastic job. Plus, her comments about the company's future are the reason many investors are so optimistic in the first place. Having said all that, I have no reason to believe that Friar's departure will derail the company's growth trajectory, and I have full confidence that Dorsey and the rest of Square's leadership will find the right person for the job. In a nutshell, Square still has the same massive long-term potential that it did as a $100 stock. Now that it's marked down by about a third, it certainly looks like one to watch as we head into November.